Are Aldi’s cheap Dolce Gusto coffee and hot chocolate pods any good? 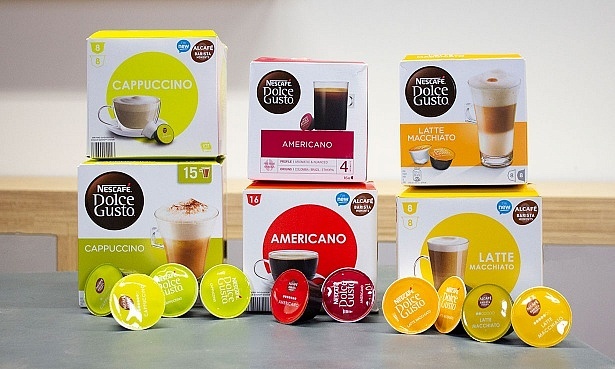 Aldi is selling Dolce Gusto compatible coffee pods at nearly half the price of the branded version, along with some unusual Mars and Twix flavoured hot chocolate pods. 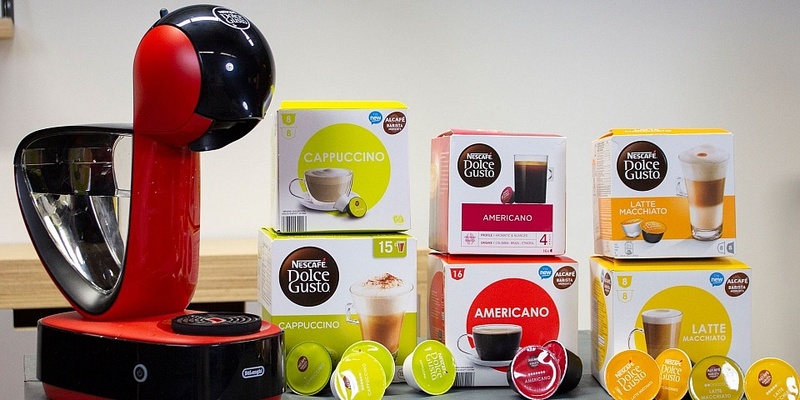 Aldi’s Alcafé Barista Moments range includes Americano, Latte Macchiato and Cappuccino coffee pods for use with Dolce Gusto machines. Switching to the Aldi pods could save you over £180 per year on your coffee habit, based on making two coffees per day with your machine. So should you stock up? We asked 22 coffee drinkers to try both the Dolce Gusto pods and Aldi’s pods in a blind taste test to see which they preferred. We also asked four Dolce Gusto coffee machine owners to try the Aldi pods in their machines and give their views on whether they’d switch from the branded pod. For curious chocolate fans, we also rounded up 16 willing volunteers to try out the Mars and Twix hot chocolate pods and rate how tasty they were, and if they really do taste like the popular chocolate bars. We asked a group of 22 coffee lovers to try both the Dolce Gusto and Aldi versions of their favourite coffee and tell us which one they preferred. Our tasters selected either the Americano, Cappuccino or Latte Macchiato pods. We hid the brands so they didn’t know which one they were trying, and mixed up the order in which they drank them too. Results varied depending on the drink: Dolce Gusto came out as the winner for the latte pods, but there was no clear favourite for the cappuccino or Americano pods. 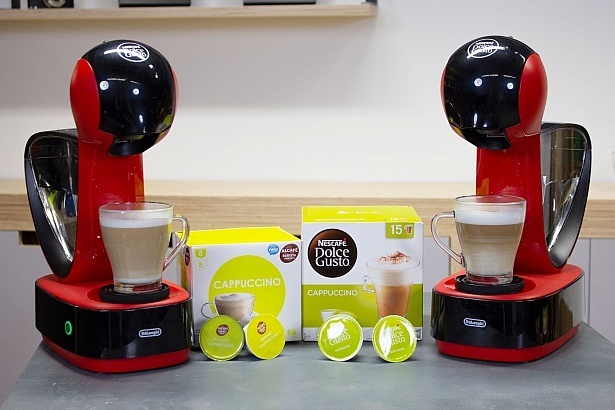 The majority of our tasters preferred the Dolce Gusto latte coffee over Aldi’s version. Our tasters thought it had a nice layer of froth on top and a good, strong coffee taste. They liked the smooth and creamy texture too. One person said they ‘wouldn’t know it was pod coffee’. The Aldi latte, on the other hand, was considered too weak in flavour and too sweet. One taster said it ‘lacked the nice coffee-bean taste of the other’. Opinions were split on this one, with slightly more people preferring the taste of the Dolce Gusto pod, but no clear favourite. Our tasters noted some big differences between the two though. 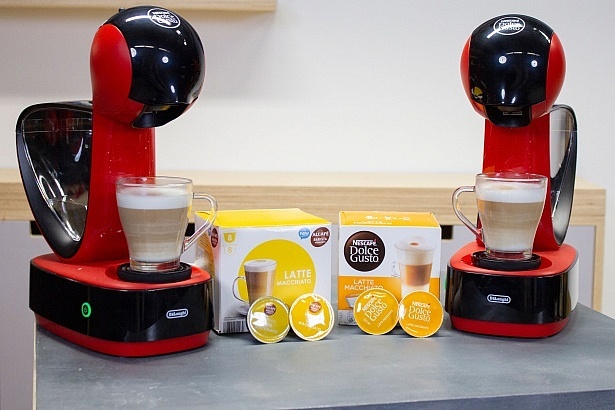 The Dolce Gusto cappuccino was described as having a rich, strong coffee taste, while the Aldi version was considered much sweeter and creamier. Some people felt it had a weaker coffee taste, with one taster describing it as ‘a bit bland’. The Americano pods divided opinion right down the middle, with half of our tasters preferring Dolce Gusto and the other half choosing Aldi as their favourite. Dolce Gusto’s Americano was considered to have a more rounded flavour by those who rated it as their favourite, with one person describing it as ‘richer with a fuller flavour’ – but others found the taste too bitter. The Aldi Americano was found to be sweeter but some tasters felt it also tasted quite artificial. 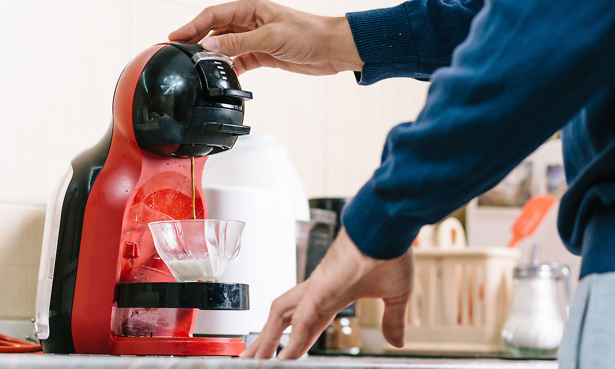 We asked four Dolce Gusto coffee machine owners to try the Aldi capsules out in their coffee machines at home and report back on their experience. Our testers thought the Aldi cappuccino had a good amount of foam making for ‘great balanced texture’ but that the taste was a little weak. One of the two testers said they would buy it instead of the branded version. The latte pod didn’t impress, with one person describing it as having an ‘odd taste’ and another saying it was ‘a little watery’. 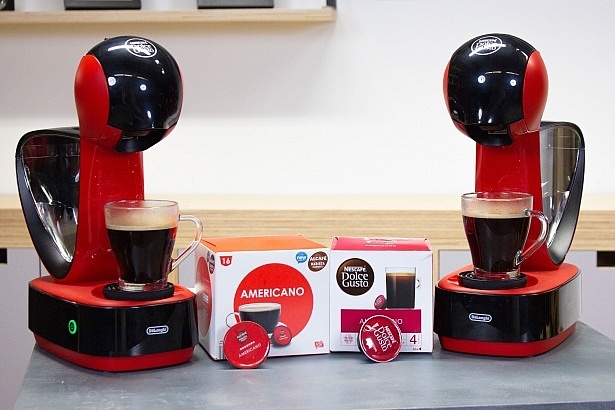 The Americano pods were a hit, with three out of four testers saying they would buy the Aldi versions for home use. One person described it as having a ‘clean coffee taste’. They found the Aldi pods generally easy to use, too, although one reviewer found the pod leaked water when they took it out of the coffee machine and another noted there was leftover coffee left in the pod after they had used it. How much could you save with compatible pods? Capsule coffee machines only work with one type of coffee pod, so you can’t use a Nespresso or Tassimo pod in a Dolce Gusto machine. Unlike owners of Nespresso Original compatible machines, who have a whole host of third-party capsule options, there’s hasn’t been a lot of choice for those with a Dolce Gusto coffee machine. Until recently, you could only buy Dolce Gusto branded capsules, which are some of the priciest around. With the launch of Aldi’s range, which is available in store and online, you could save nearly 50% by switching, a cost which could really add up over time. Asda also sells compatible pods in the same flavours, which cost around £1 less per pack than the Dolce Gusto versions. 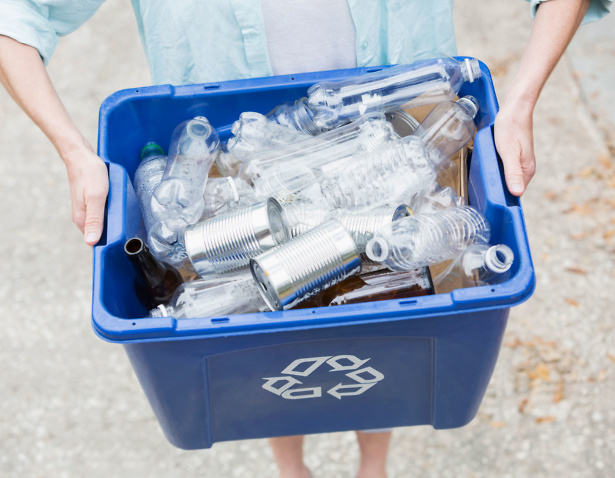 What about recycling the pods? Coffee pods are notoriously tricky to recycle. Dolce Gusto suggests you take apart and clean individual pods after use, so that the polyurethane plastic capsule can be recycled. However this is fiddly and time-consuming, and cancels out the convenience of using a pod in the first place. It is currently trialling a recycling service where you can post your used pods back to Dolce Gusto in a pre-paid bag using CollectPlus. Nespresso and Tassimo already have similar schemes. Aldi’s pods state they aren’t recyclable, so if you have concerns about creating plastic waste this is something to consider. 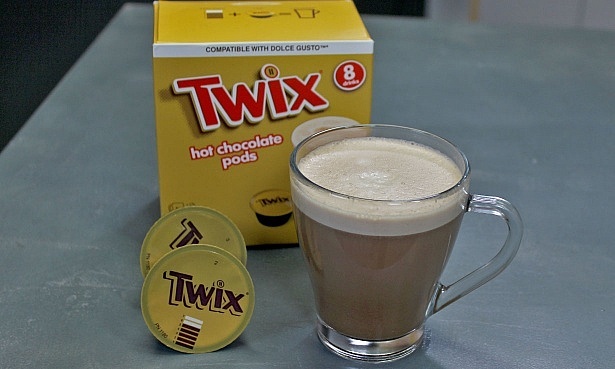 Mars and Twix Dolce Gusto hot chocolate pods: do they taste like the real thing? 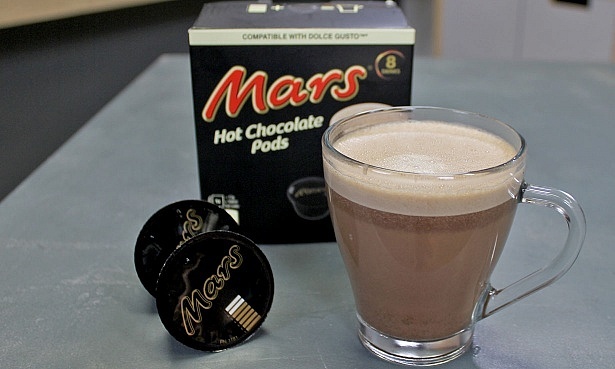 Aldi is also selling Mars and Twix flavoured hot chocolate pods for Dolce Gusto machines. These cost £2.99 for a pack of eight. The chocolate pods are being sold in stores as part of Aldi’s limited-stock ‘Special Buys’ range, which means they won’t be around for long. So is it worth stocking up while you’ve got the chance? 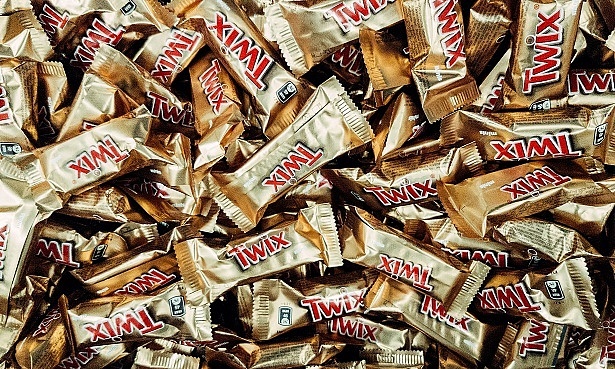 We asked some Twix and Mars fans to try them out, and they were generally underwhelmed, with both drinks falling down on not tasting like the chocolate bars they are supposed to emulate. Our tasters really liked the appearance of this hot chocolate, with its dark, chocolatey colour and thick layer of creamy froth on top. Unfortunately, the taste was a big letdown. The flavour was considered too weak, with one person saying they ‘would expect a more powerful flavour’ and another saying it was ‘un-Marsy’ and just tasted like an ordinary instant hot chocolate. The texture was a bit watery too. None of those who tried the drink said they would buy it. The Twix hot chocolate was also praised for its foamy topping, but the colour of the drink was quite pale and didn’t look very chocolatey. It didn’t taste very chocolatey either, with an overpowering sweetness dominating the flavour. One taster said ‘hot sweet drink would be more accurate’ while another described it as ‘too sweet and not Twix-y enough’. Some tasters picked up a slight caramel flavour, and others thought it had a distinctive biscuit taste, but overall no-one thought it tasted much like a Twix. However, it was slightly more popular than the Mars drink, with one third of tasters saying they would buy it. 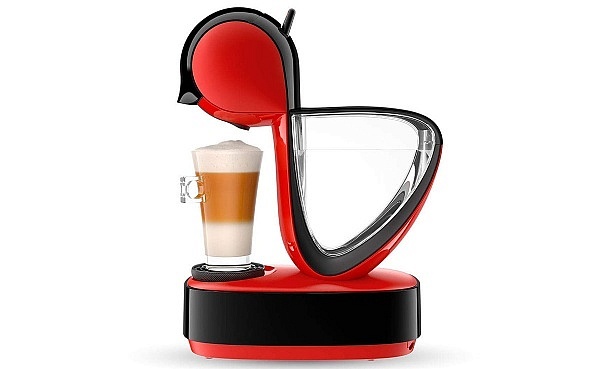 Capsule coffee machines offer a quick and simple way to make coffee at home. Simply slot your pod into the capsule holder, press a button and your drink will be dispensed. To find out more about other types of coffee machine, such as traditional ground coffee machines and bean-to-cup models, and get advice on choosing the best option for you, see our coffee machines buying guide.